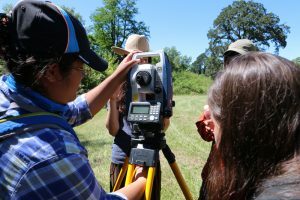 As a part of our field work with the Confederated Tribes of Grand Ronde, each student was asked to step up and take the helm on a personal leadership project. Students chose subjects related to their specific fields of interest: Ground Penetrating Radar (GPR) survey, magnetometry, the Chinuk Wawa language, cultural practices of Pacific people, and many more. 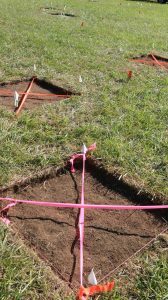 I chose to take a lead role in the process of mapping and spatial cataloging of points at the Molalla Encampment. I worked closely with PhD candidate Ian Kretzler, who helped me understand the equipment and larger project goals. For indigenous communities and the archaeologists who work alongside them, place and people are necessarily connected; they are inseparable, and deeply intertwined. A visitor might not be aware of or have context to understand the immense cultural significance and depth of history that a landscape has, inextricable from its people. This is very much the case with the Grand Ronde community. During our project, we lived in the middle of a complex landscape consisting of many culturally significant sites. 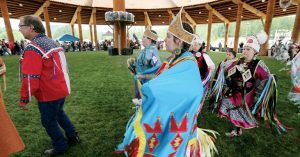 Often we were able to get a piece of the history and cultural narrative from community members and Grand Ronde’s Senior Archaeologist Briece Edwards. For guests such as ourselves, the importance of this sort of communication cannot be overstated. With this emphasis on landscape, mapping and representation in the digital realm became a subject I found rich and fascinating. Not only that, but I saw how mapping could be valuable to both CTGR and our archaeological field school. In learning techniques and making maps to guide our work and research, we would produce a lasting interactive document that the tribe could use for whatever future purposes they might have. 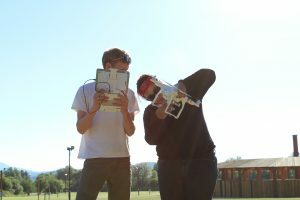 In that spirit, I hoped to be an integral part of mapping the Molalla Encampment, where we were doing a variety of low-impact surveys including GPR, magnetometry, aerial photography via drone, and catch-and-release surface collection. To begin, we divided the site into a series of 20x20m grids. This grid system allowed us to be systematic with our GPR and gradiometer surveys. In order for these tools to image the subsurface environments properly, they must be walked along narrow North-South transect lines that subdivide the 20×20 units further. This is a painstaking process, but it is important to capture the entire area of the grids in order to image the whole area and combine our GPR and gradiometer data with the GPS and other map data back in the lab. This allows us to create a vertical map with multiple layers of data that can be selected on or off, depending on the needs of the map user. The Molalla Encampment was mapped with both GPS satellite points and a Total Station — even if you don’t know the name, you’ve almost certainly seeing survey crews on roads and construction sites using a Total Station and reflective prism to calculate precise distances, elevations, and angles. To make a map, one must establish a permanent point in space to which all others are relative, known as a datum. Along with a second fixed point — the backsight– this allows all individual points in the map to be triangulated and measured easily in relation to each other. For the Molalla Encampment, we chose to map out a variety of types of points. These included the corners of our 1×1 meter surface collection units, grid points for our magnetic resonance and GPR survey, and other permanent and semi-permanent features. Capturing these more stable points allows future field teams to orient themselves precisely to where we did our work. We also chose to record a large number of points of topographical variation. Though they may be hard to distinguish when standing in the field, averaging out these small changes in elevation over the larger site in our digital mapping suite allows us to get a picture for what sort of anomalies might exist beneath the surface. Even a small variation on the Z-axis (up/down) might indicate subsurface features if they are consistent over a larger area. After gathering all this raw data in the field, it was then Ian’s task to stitch together the various layers of points. 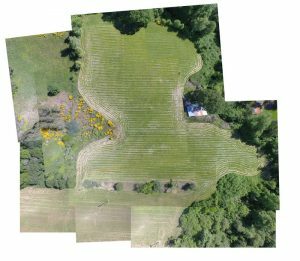 He produced a map that overlays the data points we recorded over aerial photographs taken above the Molalla Camp site in May 2016, creating a real-world map integrated with our recorded points. In organizing and presenting our research and data, the maps we produce will be invaluable tools, providing documentation, guidance, and visual context for audiences to understand our work. Maps are an important creative part of what we do, as they are uniquely generated, rather than recorded — one must produce a map. Making these maps was an exercise in learning new skills and building capacity for us as field school students, and it is our hope that they will be useful and valuable to the Grand Ronde community for the same reasons as well as their goals of management of resources and historic preservation.